WASHINGTON (CNN) -- Starting Monday, health inspectors will halt and check the shipment of ingredients common to Mexican cuisine from Mexico to the United States, sources familiar with the salmonella poisoning investigation said. Since April, more than 900 people have contracted the same strain of salmonella, but its source is unclear. The inquiry, which initially focused solely on tomatoes, has expanded to include cilantro, jalapeño peppers, Serrano peppers, scallions and bulb onions, said Tommy Thompson, former secretary of the Department of Health and Human Services, who said he has been informed of the plan. A former director of the Food and Drug Administration's import operations said the expanded search raises a number of questions. "Where's the contaminated product?" asked Carl Nielsen. "How would you know? And where along the supply chain did it happen? Was it at the retail level? Is somebody doing something to expose the product at the retailer? Is it at the wholesale? Is it at the grower? Is it at the processor? Is it in transport? Where is it? They don't know." The source of the outbreak of Salmonella Saintpaul remains unknown, but it has already had far-reaching implications. The person in the Canadian case became ill in Ontario on the day he returned from the United States, the CDC said. 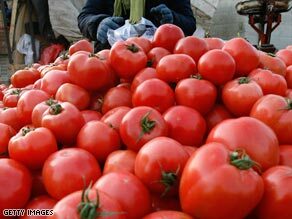 The rare form of bacteria also has cut about $450 million of tomato growers' income, said Thompson. "You don't even take into consideration the thousands of people that have been sick, and how much it's cost in drugs, loss of time and mental anguish for people who are sick," Nielsen said. Last year during the same period, U.S. health authorities identified three people infected with the same strain.